In Baltimore City, the Baltimore Greenway Trails Coalition is currently undertaking a planning study for a 35-mile multi-modal trail around Baltimore. Learn more about the proposal and FMOPL’s position on it. 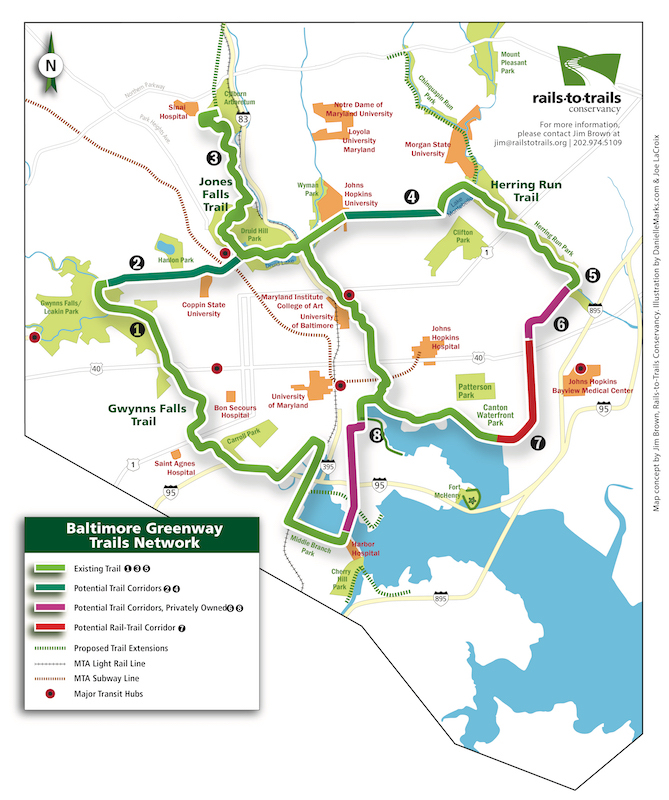 The Baltimore Greenway Trails Coalition is currently undertaking a planning study for a 35-mile multi-modal trail around Baltimore (https://www.railstotrails.org/our-work/trailnation/baltimore-greenway-trails-coalition/) that connects many of Baltimore’s parks and existing trails through a protected walking and biking trail. The Friends of Maryland’s Olmsted Parks & Landscapes (FMOPL) is a member of the coalition and has provided a letter of support for the Greenways Trail Network. In supporting the study process currently underway, FMOPL reaffirms the local Baltimore City Landmark designation for the “Olmsted Parkways,” for which it provided a leading role, and insists that all alternatives must exemplify the principles that derive from that designation. And that its goal of finding ways to incorporate well-designed pathways for pedestrian and bicycle use is consistent with the Olmsted vision. As various options are considered, whether within the median or in other forms, they must conform to the set of principles stated below. In particular, protection of the trees and green character of the designated “Olmsted Parkways” must be a major consideration. Ensure a defined maintenance plan for long-term sustainability of the greenway trails network. Called for “parkways” as East-West connectors for Baltimore’s principal parks—especially connecting Clifton Park on the east, Druid Hill Park in the center, and Gwynns Falls part on the west. Showed the proposed connector parkways as following meandering routes. Over the next decade the Olmsteds served as consultants to the Baltimore Park Commission, which, in conjunction with the Commission on Street Openings, was responsible for the actual implementation of the parkway plans. Correspondence from the Olmsteds demonstrates that they urged widths to allow for parklike treatment, and a proposed sketch by Olmsted staffer P.R. Jones in 1906 suggested a multi-modal series of tree-lined corridors, providing separately for corridors to accommodate such uses as walking, riding (horseback or biking? ), and a central road. However, the Baltimore authorities made it clear immediately that the recommended widths were not feasible. The resulting “parkways,” built by the Baltimore park and road commissions in continuing consultation with the Olmsteds, but not “designed” by them, took the form of the tree-lined central median roadways that resulted in the essential pattern that has prevailed generally for the past century. Given that historic basis, what should land-marking mean for “the Olmsted Parkways” in relation to the planning process for the Baltimore Greenway Trails Network Proposals? The essential “green” character of the median should be maintained, and any pathways must be designed and maintained in such a way that they preserve and enhance that character. Re-design of these parkways to accommodate a hiking/biking pathway is consistent with models the Olmsteds proposed here and elsewhere and that other planners, past and present, have employed.